As a rule of thumb, Washington state law dictates that pedestrians have the right of way in virtually all traffic situations. This is reasonable for a couple of reasons. The most important of those is safety. Pedestrians qualify as "vulnerable users" in Washington state. The vulnerable user law is designed to deter motorists from being careless or negligent behind the wheel, and encourages them to watch out for pedestrians and cyclists. Vehicles Avoiding Pedestrians: Every driver of a vehicle shall exercise due care to avoid colliding with any pedestrian upon any roadway (RCW 46.61.245). Vehicles Yield to Pedestrians: Vehicles shall stop at intersections to allow pedestrians and bicycles to cross the road within a marked or unmarked crosswalk (RCW 46.61.235). Pedestrians Yielding to Vehicles: Pedestrian crossing a roadway at any point other than within a marked crosswalk or within an unmarked crosswalk at an intersection shall yield the right of way to all vehicles upon the roadway (RCW 46.61.240). 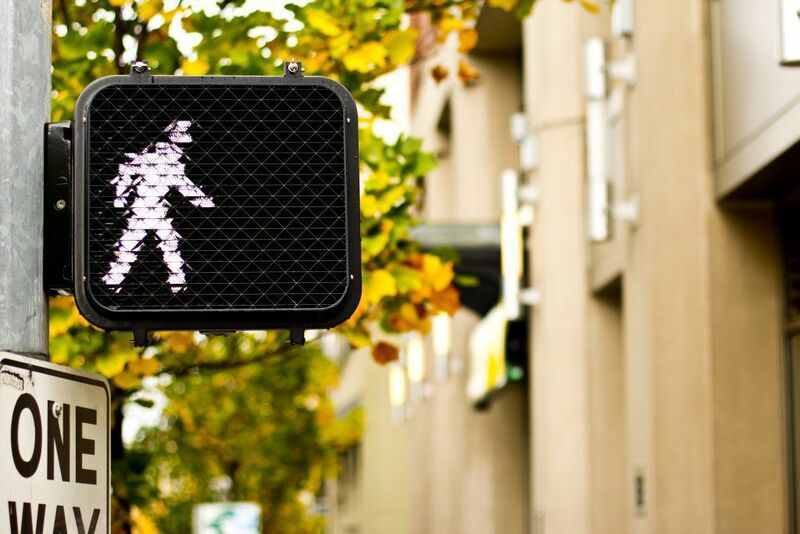 Pedestrian Traffic Signals: Pedestrians must obey traffic signals and traffic control devices unless otherwise directed by a traffic or police officer (RCW 46.61.050). Sidewalks: Drivers and bicyclists must yield to pedestrians on sidewalks and in crosswalks (RCW 46.61.261). Pedestrians on roadways: Pedestrians must use sidewalks when they are available. If sidewalks are not available, pedestrians must walk on the left side of the roadway or its shoulder facing traffic (RCW 46.61.250). Bolting into traffic: No pedestrian or bicycle shall suddenly leave a curb and move into traffic so that the driver can not stop (RCW 46.61.235). As long as a pedestrian or bicyclist is attempting to cross a roadway in a marked crosswalk or other designated crossing area, the driver of any vehicle is legally required to yield to that bicyclist or pedestrian. If there is no marked crosswalk or designated crossing area, then the pedestrian or bicyclist is required to yield to motorists. That's just straightforward, common sense. In addition to outlining who is responsible to yield to whom in certain traffic situations, it is also important to understand what implications may be derived from the responsibility to yield. For example, Washington courts have long recognized that pedestrians and bicyclists are reasonable in assuming that a vehicle will yield to them when legally required to. This means that vulnerable users are not required to ensure that a driver is abiding by those laws, and cannot be held liable for an accident simply because they failed to "double check" that the driver was yielding.